Press cap of container, insert bottle and squeeze to direct Superbowl into the bowl beneath the rim. Swab all areas of the toilet bowl, using a toilet brush, with Superbowl solution making sure that the area beneath the rim is thoroughly cleaned. Swab toilet seat with Superbowl solution and wipe dry with a soft cloth or toilet tissue. Squeeze bottle to cover entire urinal area with Superbowl and swab with toilet brush. Immediately after swabbing flush generously with water. 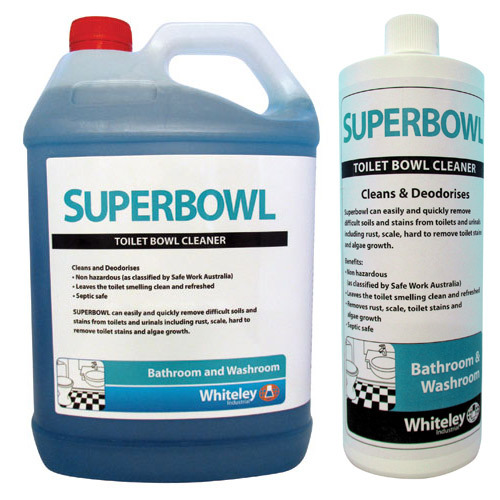 Click here for Superbowl Toilet Bowl Cleaner MSDS.